At The College of St. Scholastica, we are committed to making a college education affordable. That's why we award millions of dollars in scholarships and grants to our students every year. And everyone who applies for financial aid from CSS receives it. In fact, many students find that it is less expensive to attend CSS than it is to attend a four-year public institution. 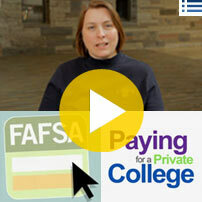 Curious about what your financial aid could be at St. Scholastica? Our net price calculators for first-year and transfer students can give you an idea. The amount of financial aid you receive is based on the Free Application for Federal Student Aid (FAFSA) so we encourage you to complete the FAFSA as soon as it becomes available. Students can now submit their FAFSA as early as October 1. St. Scholastica's Federal School Code is 002343. CSS offers several scholarships for our first-year and transfer students, some of which are awarded automatically upon acceptance. We also host an extensive directory for outside scholarships. After receiving your financial aid award from St. Scholastica, make sure you take these next steps regarding loans, non-CSS scholarships, payment plans and other items.